Fantastic Beasts brought the wizarding world in which Harry Potter dabbled with magic back to life. While this is the same world, we are taken back to the 1920s, to follow Newt Scamander on his adventures. In the first movie it was all about him making a trip to New York for his fabled beasts collection and the studies he conducts. In the meantime he also encountered an Obscurus during his travels, which is a magic user who is suppressing his abilities. When one does so for too long, an Obscurus forms and the magic user dies. Several months have passed since the occurrences of the first movie, and Grindelwald (Johnny Depp) has been in the custody of the American ministry of magic for over half a year now. It’s time to bring Grindelwald to justice for the crimes he performed in Europe, hence he is being transferred. The ministry and the transport have taken necessary precautions in order to make sure nothing can happen during the trip. Little did they know that Grindelwald already switched places with one of his followers by shape shifting and has been roaming the ministry for quite some time now. Now that he is free to go as he pleases, he is headed towards Europe to gather more of his followers. In the meantime, Newt Scamander (Eddie Redmayne) is still struggling with his travel ban, but his brother Theseus (Callum Turner) wants to help Newt out by convincing the higher-ups to offer Newt a job for the ministry. Sadly, the terms are not that good for Newt, as he’ll have to track down Credence (Ezra Miller), the boy with the Obscurus from New York, and terminate him. 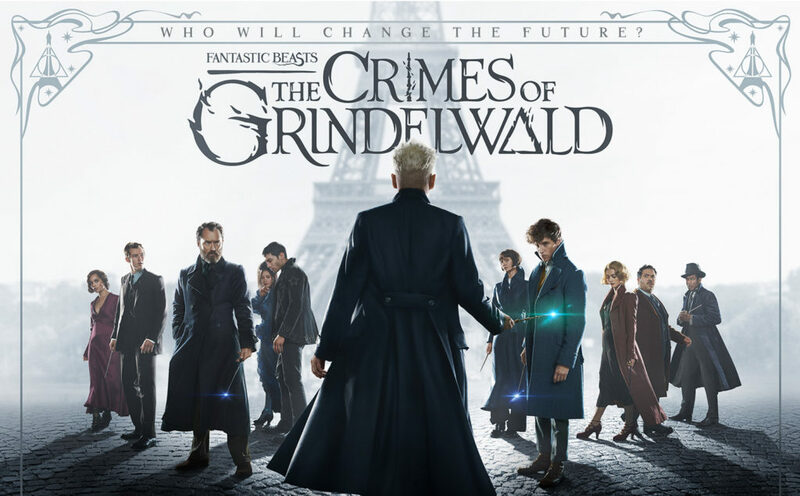 Newt rejects the offer by the ministry, but later ends up journeying abroad anyway when he is convinced by Dumbledore (Jude Law) to search for Credence and try to save him, before Grindelwald gets his hands on him. The flow of the Crimes of Grindelwald is very different than that of the first movie. In this movie it’ll be all about Grindelwald and his growing presence in the wizarding world. Other than that, it’s also about finding Credence before Grindelwald and the ministry do, as Grindelwald wants to recruit him and the ministry wants to kill him, as they fear him. You’ll of course see the interactions of Newt, Jacob, Queenie and Tina, which are also a bit more grim than in the first movie. You’ll see Queenie struggle with her relationship with Jacob, as the American ministry doesn’t allow a relationship between a magic user and a normal human. Tina is somewhat more distant to Newt, as she assumed he was to be wed, while in fact it is Newt’s brother who is getting married. There is a lot going on, but even so it sometimes feels as if this movie is actually slower than the first film of the series. As far as acting performances go, the main cast remains unchanged and still does a superb job. Every character feels a bit more grim and depressed as the world around them is also a lot bleaker now that Grindelwald is gathering his followers. Johnny Depp is more important in this movie, and while he is still an actor who is always associated with playing an oddball character, this time his persona is a lot more tranquil, which also perfectly suits him. Jude Law picks up the mantle as the young Dumbledore, and while it’s hard to picture an elderly Jude Law in the Harry Potter universe, he plays a very virile and convincing young headmaster of Hogwarts. The cast was clearly chosen with care, as it was in the original Harry Potter series. The Blu-ray version of The Crimes of Grindelwald comes with a decent amount of extras, which range from the ideas behind the movie, a snippet about Dumbledore, featurettes about how certain scenes were constructed and why, and of course a reasonable amount of deleted scenes. You’ll also see Ezra Miller and Evanna Lynch (Luna Lovegood in the Harry Potter movies) talk about how they were fans before they got into the series of movies, be it Harry Potter or Fantastic Beasts. When watching the Extended Cut, the movie will let you know which are the added scenes by marking them as ‘Deleted scene’ in the lower left corner of the screen. This is quite fun to see how these scenes alter the movie. There is no denying that the charm of the first movie was nowhere to be found in Fantastic Beasts: The Crimes of Grindelwald, safe for a few scenes where the fantastic beasts were showed. Other than that, this second movie feels more serious, as well as the interlude for the last movie, setting the décor for a grand finish. We are intrigued by this series, and we’re looking forward to see what the third part has in store for us.